Biñan, (/bɪnjaʊn/) officially the City of Biñan, (Tagalog: Lungsod ng Biñan), and known simply as Biñan City is a 1st class city in the province of Laguna, Philippines. According to the 2015 census, it has a population of 333,028 people. It comes second in Laguna coming from Metro Manila next to San Pedro City. Biñan also known as Biniang has become both a suburban residential community of Metro Manila and a location for some of the Philippines' largest industrial estates and export processing zones. Prior to its cityhood in 2010, Biñan was the richest municipality in the Philippines with an annual gross income of ₱677 million (US$14.383 million) and net income of ₱250 million (US$5.308 million), as of 2007 by the Commission On Audit. According to the 2015 census, it has a population of 333,028, making it the third largest in population in the province of Laguna, after Calamba City and Santa Rosa City. By virtue of Republic Act 10658, signed on March 27, 2015, by President Benigno Aquino III, Biñan has been separated from the First Congressional District of Laguna and formed the Lone Congressional District of Biñan. The first representative, the former mayor of the city, has been elected during the 2016 elections, unopposed. Where Biñan got its name is a mystery. Some deduced that before Captain Juan de Salcedo proceeded to Cainta and Taytay finally reaching Bay, he landed in Biñan. According to the story, Padres Alfonso de Alvarado and Diego Espinar planted a huge wooden cross on the spot where the present day San Isidro Labrador parish stands and co-celebrated a Thanksgiving Mass. Curious natives gathered and the two Spanish missionaries took advantage of the situation. They baptized each one of them. From then on, old folks say they called the place “Binyagan,” which means a baptismal place. The Spanish tongue's difficulty in pronouncing the local dialect acquired for the once town its name— "Biñan". Biñan is located 35 kilometres (22 mi) south of Manila. It is bounded on the north by San Pedro City on the south by Santa Rosa City and on the west by Carmona, Cavite. On the eastern and northern horizon lies the Laguna de Bay, the largest lake in the country. The city covers a total land area of 43.50 km2 (16.80 sq mi) that represents 2.5 percent of the entire Laguna province. In 2008, Biñan had a total population of 269,608. It is the fourth most populated in the province, (9.8% of the provincial population) next only to Calamba City (12.66%), San Pedro City (11.42%), and Santa Rosa City (9.92%). Biñan is generally plain with 85.33 percent of its total area having a slope of zero to 2.5 percent. This covers all the 24 barangay except for small portions of Barangay Biñan and San Francisco having a slope ranging from 2.6 to 25 percent, meaning it is gently sloping to strongly sloping. With more than three-fourths of its area generally level to nearly level, this makes Biñan suitable for agricultural and urban development. The climate of Biñan is characterized by two pronounced seasons; dry from November to April and wet during the rest of the year. Maximum rainfall occurs from June to September with an annual average rainfall of 200 mm. Biñan is protected by mountains in the peripheral areas, and thus it is making the area cooler. Of the eleven soil series that compose the land area of Laguna, Carmona and Gingua series covers about two types that can only be seen in Biñan. Carmona series covers about 2,577 hectares or 59.24 seen in Biñan's land area. Agricultural land in these areas is primarily devoted to rice and sugar production. Gingua series, on other hand, specifically the fine sandy type covers 315 hectares which is one of the most productive soils in Laguna where a variety of crops especially vegetables are grown profitably. The other two basic soil series comprising Biñan are Guadalupe series covering 660 hectares and Lipa series with 798 hectares. Biñan comprises 24 barangays, all classified as urban. Barangay San Francisco occupies the largest area which is about 16.83 percent of Biñan while Barangay Casile has the smallest area with only 12 hectares or 0.27 percent. Captain Juan de Salcedo discovered and founded Biñan at the end of June 1571, a month after Miguel López de Legazpi established Manila when he explored the largest freshwater lake in the Philippines and second in Asia (Laguna de Bay). When the seat of the provincial government of the Provincia de la Laguna de Bay was moved from Bay to Pagsanjan in 1688, Biñan separated from Tabuco (now the city of Cabuyao). In 1791, during the time of Pablo Faustino, Santa Rosa separated from Biñan. The following year, January 15 Sta Rosa de Lima was established and became an independent town. Historically, Biñan is nationally recognized in the books related to the biography of José Rizal, the country's national hero. It was in June 1869 when José Rizal as a young boy went to Biñan with his brother Paciano. They proceeded to his aunt's house near the town proper where they were to be lodged. Here, his first formal education was entrusted to Maestro Justiniano Aquino Cruz who after a year and a half of tutelage advised young Rizal to continue higher education in Manila. In honor of José Rizal, a plaque of recognition was bestowed on the house where he stayed at. A monument now stands at the center of Biñan's plaza in recognition of Biñan's affiliation to Rizal. Total No. of Registered Voters as of August 19, 2008: No. of Precinct: 705 ; No. of RV 114,534; Total Registered Voters: 114,534. San Isidro Labrador Parish Church, located at the downtown city plaza of Barangay Poblacion. The majority of the people are Roman Catholics. Other religious groups include are The Church of Jesus Christ of Latter-day Saints (better known as the Mormons or LDS Church), the Members Church of God International (Ang Dating Daan/The Old Path/El Camino Antiguo), Biyaya Ng Diyos Christian Fellowship, United Church of Christ in the Philippines (UCCP), Jesus Is Lord Church (JIL), The United Methodist Church, Presbyterian Churches, Baptist and Bible Fundamental churches. Biñan has been popularly recognized as the trading center area immediately south of Metro Manila. The city has the largest public market in the province of Laguna, and in the CALABARZON Region. Retailers from nearby towns often plow the city proper to purchase goods and merchandise intended to be sold elsewhere. Biñan has also been the center of commerce in the region because of the numerous banking institutions across the city, plus the ever-growing number of commercial establishments and emerging shopping centers. A common sight is the preparations and setting up of the wholesalers and the arrival of jeepneys and trucks carrying various items such as fruits, vegetables, dry goods, dairy products, meat, fish, etc. The market activity would be 24 hours with peak reaching the early hours (3:00–7:00 am) as Filipinos are known to work in the early hours of the day trying to prevent exposure to the beating sun. The city is also known for a type of pancake made from rice flour, topped with cheese or butter (Puto Biñan). There are also slices of savory salted egg on top to contrast the mildly sweet pancake base. The best known makers of Puto in Biñan are located in the barangay of San Vicente, and the city is renowned as "The Home of the Famous Puto Biñan in Laguna". Manufacturing of footwear, headwear, Puto and special pasalubong like pinipig, ampaw etc. Biñan has two industrial parks namely, the Laguna International Industrial Park (LIIP) and the Laguna Technopark Incorporated (LTI). The two industrial parks have created a good image in contributing favorably in Biñan as well as in the Philippine economy in terms of local employment and the generation of foreign exchange. To date, Biñan has benefited a large number of residents being employed in different companies there. To name a few, they are Honda Parts Manufacturing Corporation, Kito Corporation, Nissin Brake, Ryonan Electric, Cirtek Electronics, SunPower, Nidec Corporation, Isuzu Philippines, Atlas Copco, Diageo, Furukawa Electric, Takata, Toshiba Philippines, Optodev, Inc., Transitions Optical Philippines Inc., Hitachi Computer Products Asia, Amkor Anam Precision machine, Integrated Microelectronics, Inc. (IMI), TDK, Gardenia Bakeries Philippines Inc, and several other multi-national companies. An aerial perspective of the master plan for the One Asia Business Center. As of 2008, Biñan, headed by its Historical, Tourism and Cultural Council has formed "Biñan Business Club", a non-government organization composed of all business establishments of the said municipality. The Biñan Business Club works to anticipate trends and provide support to help local business enterprises and the community face them head on. The Club commits itself to the essential aspects of economic development and poverty alleviation. It knows that the Biñan community counts on the help of the organization to attract, retain and enhance business through traditional and non-traditional strategies. One Asia Business Center is a 10-hectare development located within the Jubilation New Biñan. This business park will be a major component of an integrated master planned development of Jubilation or what is called the New Biñan City which is composed of residential, commercial, recreational and institutional uses. Inaugurated on July 25, 2012, Southwoods Center, located in Barangay San Francisco, situated at Southwoods Exit along the South Luzon Expressway, has been proclaimed by the Philippine Economic Zone Authority (PEZA) as of July 2010 as a Special Economic Zone. It is a 15-hectare project which will include a strip mall, residential condominium towers, an outlet center, a lifestyle park and a Business Process Outsourcing (BPO) center, among other facilities. This soon will become the CALABARZON's premiere BPO and shopping hub. The city is accessible to all types of land transportation via South Luzon Expressway through Mamplasan, Southwoods, and Carmona exits. From the south or from the capital town Sta. Cruz, the National Highway can be utilized. Biñan City Hall at night. A new city hall was constructed on Barangay Zapote to reflect its status as a component city. The former municipal hall remains standing in the city proper, now offices the Sentrong Pangkultura ng Biñan (Biñan Center for Culture and Arts), to maintain the city's culture and arts tradition. Mayor: Walfredo "Arman" R. Dimaguila, Jr.
Wilfredo "Bong" I. Bejasa, Jr. The Rizal Monument is used to depict the heroism of the National Hero of the Philippines, Dr. José Rizal, who had his first formal education at Biñan under the tutelage of Maestro Justiniano Aquino Cruz who after a year and a half of tutelage advised the young Rizal to continue his education in Manila. The large mortar and pestle signify subterranean and earth-related resources, thus emblematizing the agricultural activities of the city, the renowned “Puto Biñan” and the “family” represents solidarity and the result of human industry and initiative in the areas of manufacturing and intellectual production. The “2010” represents the year that Republic Act 9740 was signed into law creating the City of Biñan and ratified by majority vote of its people during the plebiscite held on February 2, 2010. The book signifies the city's continuous quest for knowledge and its commitment to providing quality free education to its constituents. The industries represent the budding industries located at the Laguna Technopark and the Laguna International Industrial Park. The Heroes Monument symbolizes the bravery, sacrifice and valor of Biñan's ancestors. The pair of slippers had been adapted from the old Municipal Seal which, together with the cap represent the small businesses which originated from Biñan and entrepreneurial skills of its people. The 24 barangays that constitute the demographic profile of the Municipality of Biñan. Their golden color signifies their individual verdant and abundant indigenous resources readily available for conversion into productive and profitable uses. The elements enumerated above are encircled at the outer edge by a golden circle, wherein the words “City of Biñan” are written within. The two golden stars flanking the words “City of Biñan” represent Service and Integrity. On January 26, 2015, a 15–0 vote from senators approved the House Bill 3917 in the third and final reading, amending the charter city of Biñan to a congressional district in Laguna and will be separated from the first district. Republic Act 10658, which President Aquino signed into law on March 27, 2015, separated Biñan from the first legislative district of Laguna. Under the law, the incumbent representative of the first district of Laguna will continue to represent the new district until the expiration of his term. The Commission on Elections was tasked to issue the necessary rules and regulations to implement the measure within 30 days after its effectivity. Former Laguna First District Rep. Danilo Fernandez hailed the passage of the law, saying it would improve the delivery of services to Biñan residents. He said Biñan has met the population and revenue requirements to be a legislative district. The University Of Perpetual Help System Laguna. Biñan is also considered the educational center of the first congressional district of Laguna, having the most number of secondary and tertiary schools in the area. Most barangays in the city also have their own respective public elementary schools. Biñan has 3 universities: the University of Perpetual Help System Laguna, the first university in the city, located at Barangay Sto. Niño via the National Highway; the Polytechnic University of the Philippines – Biñan Campus, located at Barangay Zapote; and De La Salle University Science and Technology Complex at Barangay Malamig. The city is well known for its popular summer destination, Splash Island, the Philippines’ premiere water recreation theme park. It is located at Barangay San Francisco, accessible via South Luzon Expressway (SLEX) through Southwoods Exit. Notable malls and shopping centers in the city include the Southwoods Mall, Central Mall, Pavilion Mall, managed by Ayala Malls, located in between Barangay San Antonio and Barangay Santo Niño; Biñan Central Mall, located at the busy intersection in the city's downtown, opened on September 9, 2011; and the Umbria Commercial Center, located just beside Pavilion Mall, also in Barangay Santo Niño. Southwoods Mall by Megaworld opened in September 30, 2017. The collapse of the Alberto Mansion. In 2009, the National Cultural Heritage Act was signed into law, by the NHCP, stating that structures at least 50 years old are to receive special protection from the government. The Alberto house is more than 200 years old. According to the law, such buildings cannot be demolished without a permit from the National Commission for Culture and the Arts or NHCP. As national cultural treasures, they are entitled to privileges such as "priority government funding for protection, conservation and restoration." Also stated on the law, there should be a Conservation Incentive Program that encourages private individuals to restore and maintain such structures. The law further commands that an official heritage marker be placed by the cultural agency concerned to indicate that the immovable cultural property has been identified as a national historical site. Biñan is historically known as the place where José Rizal received his first formal education. He was about eight years old when he and his brother, Paciano left Calamba and settled in Biñan. There, he used to reside in his mother's ancestral home, owned by the family of Jose Alberto Alonzo, the father of Rizal's mother, Teodora Alonzo. The Alberto Mansion, built in the early 19th century, is a two-storey house with a floor area of about 600 square meters and is currently located at the Poblacion across from the city government building. The property has been passed down to his heir, Gerardo Alberto. The city government of Biñan aimed to declare the Alberto Mansion a heritage site. The city council had approved the release of Php 20 million (about US$482,000.00) for the purchase of the 2,000-square-meter property, but Gerardo Alberto declined the offer and sold the 200-year-old mansion to Gerry Acuzar, owner of Las Casas Filipinas de Acuzar, a heritage resort in Bagac, Bataan. Much of the house's interior had been dismantled and brought to Bataan, where Acuzar is rebuilding it, using the doors, pillars and other appurtenances from the original structure. Then on October 22, 2012, the house collapsed from its roof. The residents suspect that the dismantling of the interior of the house (without a demolition permit from the city government), might have caused the collapse of the roof. The partial collapse of the mansion became a huge call to the Biñan government for the Alberto Mansion's expropriation. Heritage advocates led by the United Artists for Cultural Conservation and Development, City of Biñan Inc. (UACCD), the municipal government of Biñan, and its residents believe that only the current Philippine President can turn the tide. He can empower the National Historical Commission of the Philippines to restore and repair the house. The Sentrong Pangkultura ng Biñan (Biñan Center for Culture and Arts, or the Biñan old Municipal Building) houses the Biñan City Museum and the Biñan City Studies Center (Biñan City Archives). The building also the home of the Biñan Center for Performing Arts, which includes the following art groups: Biñan Metropolitan Chorus (chorale), Biñan Youth Performance Council (theater arts), Biñan Folkloric Dance Troupe (traditional dances) and Biñan Kawayan Music Ensemble (bamboo instrumentalists). The Biñan City Culture, History, Arts and Tourism Office (BCHATO) is also housed on this building. In 1869–1871, Dr. Jose P. Rizal received his first formal schooling in Biñan under the tutelage of Maestro Justiniano Aquino Cruz. Outside the school site is a national historical marker from the Philippine Historical Commission installed in 1958. On August 1, 2016, the City Government of Biñan opened the School of Rizal Site and Museum to the public after its acquisition from the Gonzales Family in 2015. The three-day Araw ng Biñan, commemorates the cityhood anniversary (February 2), Biñan's liberation day from the Japanese Imperial Forces (February 3), and the remembrance of the founding anniversary of Biñan (February 5). Happening every first week of February since 2011, the Puto Latik Festival is to commemorate the Puto Biñan, which is Biñan's rice cake delicacy, and the Maglalatik traditional dance that originated from Biñan. However, beginning 2017, it shall be celebrated every May 15–23, because of the Maglalatik's historical significance to the celebration of San Isidro Labrador's feast day, the city's patron saint. Barbie Forteza – is an actress from Laguna Philippines, she is best known for her role in Pilyang Kerubin, Stairaway to Heaven, Meant to Be and Inday Will Always Love You. Marco Sison OPM Icon,Singer, Recording Artist, former councilor from Biñan, Laguna. ^ "City". Quezon City, Philippines: Department of the Interior and Local Government. Retrieved 30 May 2013. ^ "Province: Laguna". PSGC Interactive. Quezon City, Philippines: Philippine Statistics Authority. Retrieved 12 November 2016. ^ a b c d Census of Population (2015). "Region IV-A (Calabarzon)". Total Population by Province, City, Municipality and Barangay. PSA. Retrieved 20 June 2016. ^ "2007 Financial Statements Highlights for Local Government Units" (PDF). Commission On Audit Philippines. Archived from the original (PDF) on September 20, 2009. Retrieved August 26, 2012. ^ "Total Population by Province, City, Municipality and Barangay: as of May 1, 2010" (PDF). 2010 Census of Population and Housing. Philippine Statistics Authority. Archived from the original (PDF) on October 29, 2013. Retrieved October 24, 2012. ^ "Weatherbase: Historical Weather for Philippines". Weatherbase. 2008. Retrieved May 27, 2009. ^ Census of Population and Housing (2010). "Region IV-A (Calabarzon)". Total Population by Province, City, Municipality and Barangay. NSO. Retrieved 29 June 2016. ^ Censuses of Population (1903–2007). 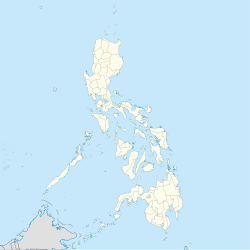 "Region IV-A (Calabarzon)". Table 1. Population Enumerated in Various Censuses by Province/Highly Urbanized City: 1903 to 2007. NSO. ^ "Province of Laguna". Municipality Population Data. Local Water Utilities Administration Research Division. Retrieved 17 December 2016. ^ "One Asia Business Center". earthandstyle.com. Retrieved August 26, 2012. ^ "Southwoods Center to become to P2.5B BPO Center and IT Park". Sun Star Manila. Retrieved August 6, 2012. ^ "Biñan City now a congressional district". Manila Bulletin. Archived from the original on 2015-11-26. ^ "Biñan now a congressional district". The Philippine Star. April 2, 2015. ^ "A BRAVE NEW WORLD The De La Salle University Science and Technology Campus". Archived from the original on 2014-02-03. ^ "Republic Act No. 10066 – National Cultural Heritage Act of 2009". ivanhenares.com. April 15, 2010. Retrieved November 11, 2012. ^ "Biñan to declare house of Rizal's mother a heritage site". GMA News Online. June 11, 2010. Retrieved November 11, 2012. ^ "Crumbling heritage". Philippine Daily Inquirer. October 26, 2012. Retrieved November 11, 2012. ^ Maricar Cinco (October 31, 2012). "Biñan execs warn of rap over Rizal mom's house". Philippine Daily Inquirer. Retrieved November 11, 2012. ^ Pia Ranada (November 3, 2012). "The Tragedy of Bahay Alberto". rappler.com. Retrieved November 11, 2012. Wikivoyage has a travel guide for Biñan. Wikimedia Commons has media related to Biñan City. Wikisource has the text of the 1911 Encyclopædia Britannica article Binan. This page was last edited on 15 April 2019, at 04:46 (UTC).